A new poster for upcoming indie film, Bellflower, has been released over at Motion/Capture, and it really is a brilliant combination of beauty and intensity, and by the sound of things, it fits the film perfectly. Made on a shoestring budget, the film is being distributed by Oscilloscope Laboratories and will be released in the US on 5th August this year. Unfortunately, no word yet on a UK release date, but I’m really hoping it will come to us too. 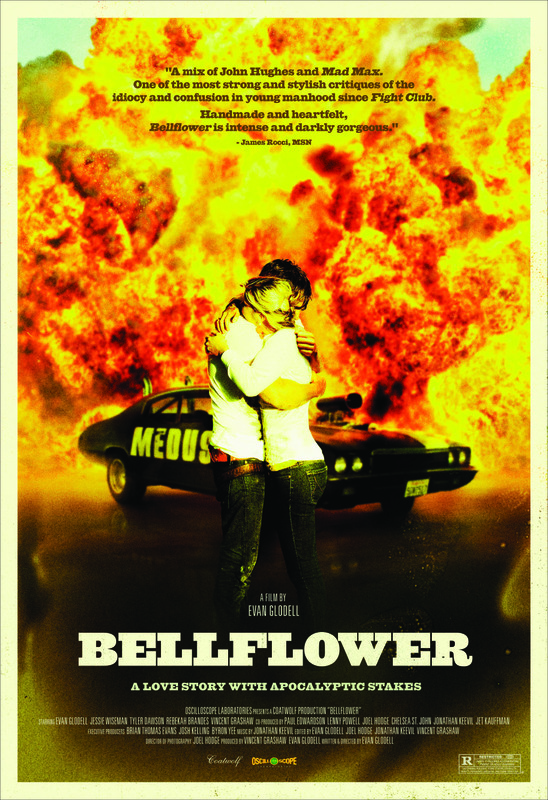 Bellflower is written and directed by Evan Glodell, who makes his writing, directing, and acting debut with this film, and also stars Jessie Wiseman, Tyler Dawson, Rebekah Brandes, and Vincent Grashaw, all unknowns. The film was well received by critics at its Sundance premiere back in January despite its low budget and unknown cast, and watching the trailer (which you can, and should, watch here), it’s not hard to imagine why. Glodell looks to have made an awesome film in what is set to be an impressive debut. It immediately calls to my mind last year’s indie film, Monsters, which I absolutely love, and whilst I can’t say for sure, I have a feeling that Bellflower will be my Monsters of 2011, my favourite indie film of the year. Take a look at the poster below and see what you think. As usual, click to enlarge.